0.01MB. Updated 2019-03-06. 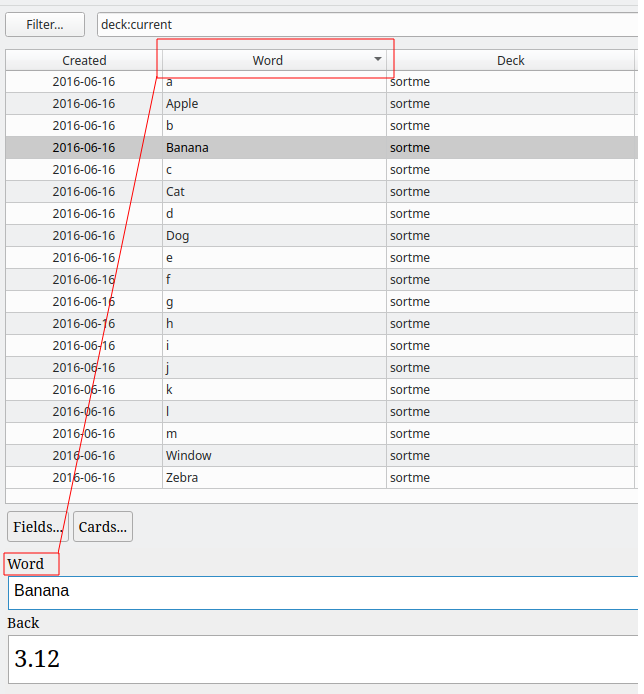 Supports both Anki 2.0.x and 2.1.x. Very useful when working with Batch Note Editing Addon. Just found one flaw that with this add-on Undo doesn't work in Browser. If you delete some cards in browser by mistake then you can't Undo and the cards will be gone for ever! I tried several things and figured out that this add-on is a culprit! I'm using Anki Version 2.0.52. and if you have some time please can you fix this bug? I'll appreciate that! Fantastic addon! One thing that would help data-driven browsing: separate columns for "reviews" that count learning or relearning reviews (instances where a card is seen in filtered, learning, and re-learning steps) separately from actual reviews (instances where a cards is reviewed in a young or mature card status). Great work. Just what I needed! Great pluggin! It should be included by default to Anki! The columns and sorting options it provides are superb! Thanks a lot. Very helpful when I want to reorganize my flashcards. Excellent, minor issue being that the "marked" tag does not show on top. "An error occurred in an add-on. TypeError: unbound method _linkHandler() must be called with Reviewer instance as first argument (got AdvancedBrowser instance instead)"
Thank you very much for this addon! Super helpful! I always wanted to know how much time I spend on certain cards such that I could spot cards that I should rewrite or delete. With the help of this addon I can see e.g. the average and total time spent :) Thanks! Some decks appeared to have (0 cards shown; 0 selected) although they have tens of subdecks and thousands of cards. I had to remove all addons one by one till I found the culprit. Saved me tons of time and show very useful info. This is a must for everyone who wants useful feedback! This is great and very helpful! However, it keeps crashing on me. Does not show any search results, I have to continually un-install and re-install until it starts working again. Any solutions?!?! Thanks! and see which problems the students took the most time on. It also allows the students to go into the browser and work on these problems that took more time to work. For classroom work this is awesome. Thank you so much for this added functionality. Has been one of the first add-ons I download on any new Anki installation for years now. Thanks for the continuous support and development. It would be nice to have an ability to create custom date field to sort historical events (including CE and BCE). Thanks for making this addon. Greatly enhances the browser, much appreciated! Thanks for creating this add on. Now why you gotta keep taking my little scrolly bar thingy and movin' it all the way over there to the right side? I want my scrolly bar on the left side, and I want it to say there see? Seems every chance you get you take my scrolly bar and move it to the right and I've just about had it up to here with it! Why I oughta'... You leave my scrolly bar alone, see! You just did it again! Here I was minding my business, repositioning a card, and then what do you know -- you went and moved my scrolly bar all the way to the right as soon as I had my back turned! That's a low blow, mister--a real low blow. Phenomenal add-on, but it'd be nice if we'd get a down/continute arrow for other fields. Thanks a million for this addon. And doesn't take anything away. Programming at its best. Sorting by any field is a goldmine in itself. 1. Can now add/remove columns, including the user-defined fields (use right mouse click). Sort all columns just by clicking header. Nice work! Both these capabilities certainly should be added to the vanilla version on Anki. After installing this add-on, you have to first manually add the "sortable" fields to the browser view, as the default fields are still non-sortable. Functionality that should be core, well executed. What more can I say. This add-on will make using Anki that much easier and more intuitive. This addon helps the Card Browser function as a useful Note Browser as well. It seems well written (wouldn't crash for me) and include what should be a core Anki feature: the ability to sort on any arbitrary field. Thank you Houssam Salem!